The beauty of telling stories to your loved ones is they find hilarity in them. The drawback is you are often reminded of things you didn't enjoy when it was live and unfolding the first time. Recently I was reminded of some serious foolery and previous sharing. So once again, let's tell the story. I mean, why not start today off with some snickering? Long before meeting JohnnyMac, I was a girl about town. More Charlotte York than Samantha Jones, mind you, but I fully embraced the freedom, experiences, and sometimes antics and anecdotes singlehood provided. I would not change my life one bit, because each of these roads led me to to where I am now, which is exactly where I want to be. But, let's be candid. While all of my experiences have intertwined in different ways to make this caravan of my life a great one, all roads are not created equal. Some roads were the autobahn, some were slick two lane highways, and a few, well, a few were bumpy dirt roads strewn with handfuls of empty beer bottles. And some roads were laden with rather funny stories. And those stories should be shared. This is one of those stories. And my memory was prompted as my Mom and I were watching something this weekend and during an odd scene involving an odd character, she leaned over to me and whispered, "chicken lady..."
Let's get down to the grit. Oh, it is not exactly brief. Get your coffee. Back in grad school, and out on the town one night, I met a guy and we began to fraternize fairly frequently. He was already a decade out of college and working downtown. One evening, after watching one of his baseball games, I make the mistake of not going home to read Criminal Procedure, and instead I join him and his team for consumption of cocktails. We were far from the sleeping over stage but after many o' beverage, I was in no way going to drive home. He asks me to sleep over, you know, really for my safety than to try to mack on me. Mmm hmm. I ride with him, and his friend follows in my car. Such gentlemen. My car safely parked, we bid his friend adieu. Darren....... would you like some chicken? It is PITCH BLACK and I literally jump out of my skin. What is that? He flips on a light and look there, a woman is sitting on a kitchen chair. He says, "Hi Mom." My mind is lightening quick with questions. Things like, why is your Mom at your house, in the middle of the night, sitting in the dark, offering savory snacks like its all perfectly normal. I could not adequately voice the severity of my discomfort. He declines the chicken. And she immediately asks Who is your friend? Not quite Joan Crawford-ish but not June Cleaver, either. Giving him a severe pummeling seemed like a fantastic idea at the moment. He grabs my hand, two bottles of water and leads us away from the situation. His first statement is something only Matlock could have deduced: He lives with his parents. He was 32. Really? I figured it out. Sign me up for 21 Jump Street. Now we are downstairs in his man-den. A man-den which includes the entire basement of his parents house, also known as his living quarters. Fooseball. Pool table. Donkey Kong. Living at home had its perks for this cat. He tries to explain his situation and yet nothing comforts me from the previous scenario involving a creepy person lurking in the dark with a plate of barbeque fowl. So I smile brightly, like, OF COURSE! This is FANTASTIC!! And then I see behind his pool table what appears to be a collection of Playboys. And by "collection" I mean WOW, there are hundreds and hundreds of Playboys. Playboys from back in the day when Hef wanted to name it Stag Party. He immediately told me they belonged to a friend. A friend with a big affinity for the visuals, I see. The mags were not a deterrent because any naughty intent on his part was washed out with cold water when his Mom appeared. Are you KIDDING ME!?!?!?! I don't even have that movie. Wait, what is that sound? Oh..that? It is your stock falling. I fall asleep in a big chair before he wakes me up and asks if I want to sleep in his bed to be more comfortable. Sure. It is a water bed. Because the hits just KEEP ON COMING. Water bed? 1997? Those two words and that date do NOT go hand in hand. I decide to sleep all bundled up. As he attempts to kiss my forehead goodnight, his shoulder hits the nightstand sending a 32 ounce cup of water onto me and the pillow and sheets. He says we can change the sheets. Except he has no more clean sheets. Because while having your own Donkey Kong machine MIGHT seem like the best value-add of living at home, I would rank it BEHIND another bonus called clean laundry. But no. He chose Donkey Kong. And the late night chicken platter option. I ask if I can sleep on the couch in his man- den. He only says, "I wouldn't". OH, yum. Free DNA samples. No buzz in the world could last thing long but now I am exhausted. I hoped that sleep would bring me a better perspective. I wake up a few hours later. Blanketed up, rather burrito style on the Partridge Family-esque water bed. Gray light creeping through the windows. And daylight has the skill of making this place look even worse. Dim lighting is a sloppy bachelor's friend. Daylight is not. But perhaps what is most startling is the fact there was a face about 4 inches from my face. And it wasn't his. His Mother had come down to check on me. And to ask me if I wanted breakfast. And if I slept alright because she noticed the sheets bundled up on the floor. And was there something wrong with those sheets to cause them to be on the floor? And to imply she hoped I was dressed under my burrito blanket. I am sure the next question was going to be whether I preferred my carcass being dumped in the river or in the woods but I had no time for that. She left and I was gathering my wits and my belongings, he woke up. I told him in a wee bit of a hiss/terse fashion You're mother was just down here asking me a dozen questions. I know. I pretended to be asleep. He got up to walk me out. No thank you. He tried to kiss me goodbye. No thank you. He told me he would call me later. No thank you. He asked if I still wanted to go to the Counting Crows concert. YES. DAMMIT, I really wanted to go to that concert but No, no, no and no thank you. Because the only thing better than a 32 year old bachelor who conveniently forgets he lives at his parents house, has a Mom who sits up and waits for him to return home in a lurky fashion, has a stash of about 3000 Playboys but of course only for "a friend". 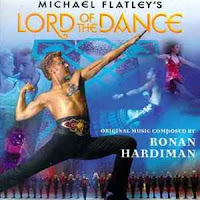 The same man to whom it never occurs it might be wise to say the Lord of the Dance DVD also belongs to "a friend" and has not a clean sheet to be found, is all of those same exact qualities in a 32 year old who pretends to be asleep while his overnight guest gets interrogated by his Mommy. See, I told you some of the roads might have been dirty and bumpy, but they were not without their share of comic value. There is a time in our lives, a slipping point, where we travel an arc from belief to disbelief. Or more specifically from when we go from believing in magic to the complete acceptance that it can't or doesn't exist. We want cold, clear facts. We want to solve mysteries. We want to see behind the smoke and mirrors. We can't predict when it happens, whether we are 7, 17 or 40 but it seems to impact almost everyone. Years ago, I attended a global meeting of my then company. We had a special speaker from Nike, Inc. come in. He was young, spirited, dynamic. At one point early on, he asked this room of thousands of people, "Raise your hand if you are creative." A paltry number of people raised their hands. He asked the question again, louder, with more emphasis. The same response. He knew his audience. This was a top shelf company and the group in the room were some of our biggest performers. He explained that when he asked a room of 2nd graders the same question, almost every single child would raise their hand. He then discussed how we as adults limit ourselves as we limit our thinking, especially as it pertains to our own capabilities. A few minutes later, he held up a large, bright blue glass bottle. He said, "In this, I have magic. Who wants some?" Not a single person moved. He said again, "IN THIS I have MAGIC. Come to the front of the stage if you want some." Still no one rose. He went on for the next hour talking about magic, creativity, motivation and why these are critical values at Nike. At the end of the presentation, he presented the blue bottle again, and this time hundreds of people went to the front of that stage to absorb his magic, his electricity, his own powerful belief that yes, anything is possible. MiniMac is quite particular about his clothing. He likes tiny versions of basically the same clothes my husband wears: collared shirts, golf shorts, flip flops, tiny aviator sunglasses. But did you see the movie Big Daddy? There is a portion of the movie where the young boy decides he wants to dress himself and go by the name Frankenstein. Once in awhile, MiniMac makes a costume change and appears ready to go as is, to which JMac and I simply reply, "You look good, Frankenstein." The first time was as a 2.5 year old he wanted to wear his University of Georgia football helmet into the grocery store. Another time was when he asked to wear his Toy Story pjs and Buzz Lightyear slipper boots to the movies. Several weeks ago, he dressed for school and then came to the kitchen ready to go. I told him I liked his cape. He advised me it was so he could fly on the playground. "And the antlers?" I asked. He told me the antlers were like Rudolph's, who can also fly. One way or another, this kid was flying today. And it was an amazing rewind to that day, in that meeting, where we talked about the power of creativity and how we as adults limit ourselves by limiting that creativity. I am not suggesting we sit in board meetings with antlers or capes. But it reminded of the time in our lives when we thought anything was possible. And when we were kids no one would even dream of telling us we couldn't do it all. As I watched my son traipse into school that day, cape and anters on, and yes, walking through sunbeams, he believed anything was possible. Like I used to believe as well, just as you did. When you believed you could fly with one magical cape. Or you could grow up to be a super hero. Or that Santa Clause would come to your birthday party if only you asked him. This was the time you believed you would see a unicorn, catch a dragon, leap tall buildings in a single bound. This was also the time when kisses healed boo boos and all you needed to overcome fear was a hand to hold. 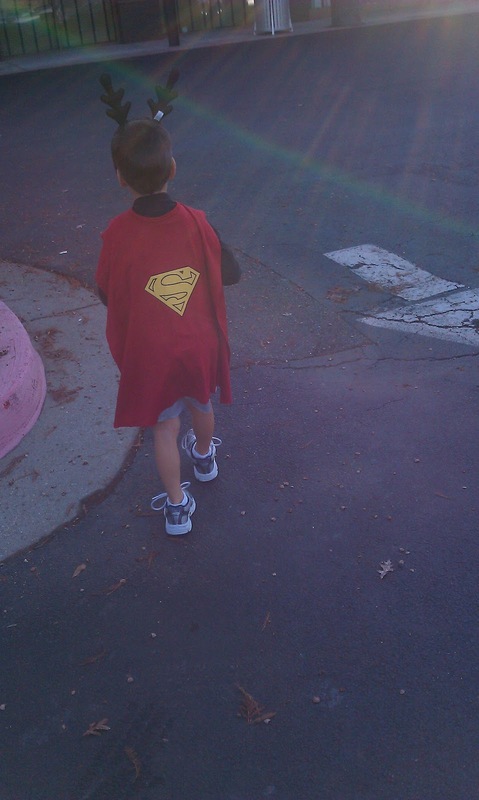 When we picked him up at school later that day, he still had the cape on. Later that night, we read a book full of castles and dragons. MiniMac told me he caught a dragon once too. I asked when and he said, "You know, when I was King..."
Its full acceptance of creativity and perhaps the best demonstration of Descartes philosophy: I think, therefore I am. You know, when you were King.